Pfizer Inc. (PFE) and Merck & Co. (MRK) are being pulled into an expanding congressional investigation about the agreement drugmakers reached with the Obama administration to support the Democrats’ overhaul of the U.S. health-care system, according to three people familiar with the talks. The probe began last year, with Republicans on the House Energy and Commerce Committee seeking documents from an industry trade group, said the people, who aren’t authorized to speak publicly. ...said one of the people. 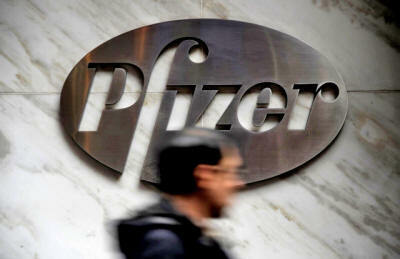 A man walks past Pfizer Inc. headquarters in New York. The Republicans last month began negotiating directly with the companies in e-mails, calls and meetings demanding documents and information outlining what the industry agreed to with President Barack Obama in 2009 and 2010, when the law was being worked on in Congress. Michael Burgess, a Representative from Texas, said he’s been frustrated by a lack of cooperation. “This has been like pulling teeth, trying to get information,” said Burgess, a Republican working on the panel’s investigation, in a telephone interview. A White House spokesman declined to comment about the investigation. Peter O’Toole, a spokesman for New York-based Pfizer, said the company is cooperating, as did Tony Jewell, an AstraZeneca spokesman. Kelly Davenport, a spokeswoman for Thousand Oaks, California-based Amgen, said the drugmaker is aware of the probe. The investigation is part of a tenuous relationship that has developed between the industry and politicians since passage of a law that expanded health insurance to more than 30 million Americans, said Alec Vachon, a health-care consultant who is president of Hamilton PPB in Washington. The pharmaceutical industry has loosened its ties to Republicans, who were united in voting against the law. About 54 percent of the industry’s political donations in the first quarter of 2012 went to Republicans, down from a 74 percent share in 2002. “It’s an inconstant love,” Vachon said by telephone. Past investigations by Republicans have mostly been focused on patient safety or Medicare. This is more political, he said. The almost $1 trillion, 10-year plan for overhauling the health-care system passed through Congress without a single Republican vote in either the House or Senate. The insurance expansion is funded partly by more than $100 billion in taxes and discounts on products the drug industry offered to the White House. In return, the newly insured will be able to buy the drugmakers’ pills using their new coverage. The committee’s demands so far have been limited to e-mails and meetings with company lobbyists and lawyers, without subpoenas or formal letters that can be used to push uncooperative targets into compliance, a person familiar said. “We have been cooperating with the committee on an ongoing basis since the investigation began,” said Matt Bennett, a spokesman for the Washington-based Pharmaceutical Research and Manufacturers of America, or PhRMA. Adelle Infante, an Abbott spokeswoman, and Ron Rogers, a spokesman for Merck, didn’t immediately reply to e-mails seeking comment. Drug company executives have said they are worried that providing the committee with a bundle of documents will create more problems than it solves, according to two people familiar with the investigation. Parts of the health law expanding insurance coverage have been challenged as unconstitutional by 26 states, which may make this year treacherous for the industry. PhRMA says that in addition to the $100 billion companies are giving up over a decade to help fund the law, the industry is concerned that its profits will be used by the government to fund future health legislation that could flow out of a Supreme Court ruling against the law. The trade group cited a potential overhaul of Medicare’s payments to doctors, or new health insurance rules. A Supreme Court ruling that invalidates parts of the law could restart the debate on what to do about health care, said Eli Lilly & Co. (LLY) Chief Executive Officer John Lechleiter. The court plans to rule on the law’s constitutionality in June. The industry has found little sympathy from Democrats, who say drugmakers still get too good a deal from government health- care programs. A proposal in the Obama administration’s fiscal 2013 budget would cut $156 billion over a decade from Medicare and Medicaid spending on the industry’s drugs. Taking more money from drug companies would result in lost jobs and fewer future cures, said John Castellani, CEO of PhRMA. “I see our critics and their one-dimensional focus on costs, and I say, ‘How dare they?’” he said in a speech at the annual meeting last month. PhRMA and the rest of the drug and health products lobby, Washington’s largest, spent $240 million in 2011 and registered over 1,500 lobbyists, according to the Center for Responsive Politics. Along with drugmakers, the committee has asked questions of about 10 other groups, including doctors and hospitals. They also demanded that the White House turn over information on negotiations between the health industry and Democrats, and have so far been foiled. “This is not a beef with anyone in the industry. I’m perfectly OK that they went to the White House and advocated on behalf of the industry, that’s part of the way things are done,” Burgess, the Republican from Texas, said.